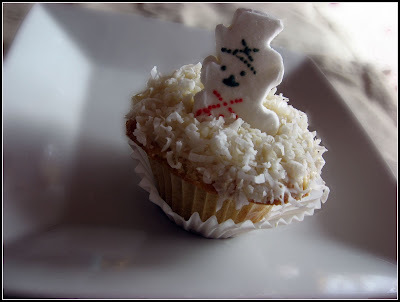 The best coconut cupcakes topped with cream cheese frosting and snowmen marshmallows. Preheat oven to 350 degrees F. Line 12 (regular-sized) muffin cups with paper liners. In a medium sized mixing bowl, sift together flour, baking powder, and salt. In a large mixing bowl, using an electric mixer on medium speed, beat together butter and sugar until creamy, about 1-2 minutes. Beat in extracts, eggs, and oil, and beat an additional 1 minute, or until well combined. Reduce mixer speed to low; gradually beat in flour mixture and milk (alternating), until just combined. Divide the batter into muffin cups, filling full. Bake at 350 degrees F, for 20-25 minutes, or until a toothpick inserted into cupcakes comes out clean. Cool in pan for 10 minutes, before removing cupcakes to a wire rack, to cool completely. To make the frosting, beat together cream cheese and butter, in a large mixing bowl, using an electric mixer on medium speed, until creamy, about 1 minute. Reduce mixer speed to low and beat in confectioners' sugar, and coconut extract, until just combined. Increase mixer speed to medium, and beat frosting for an additional 2 minutes. Spread frosting over cupcakes, and dip cupcakes into flaked coconut. Top with a marshmallow! 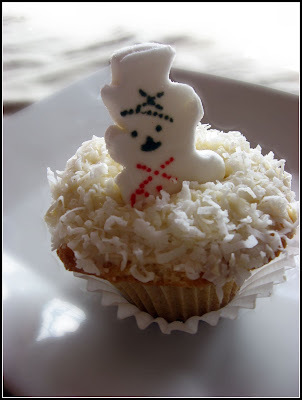 28 comments on "Cute Snowmen Coconut Cupcakes"
Hola Emiline! Doesn't the weather influence us a lot? I can't stand cloudy/rainy days (more than 3 in a row)... I get depressed! Thank God I live in Spain... So I'm blowing some of our good weather to you so that you have a nice day! Lovely desserts! And yes, very nice pictures! Too cute. I'm seeing green coconut and jelly beans for Easter! First of all - I love coconut and these sound amazing!! Second, that snowman brought back so many memories! One of the last roommates I had before I got married started this game with a snowman peep. She would hide it in our condo, and once I found it, I would hide it. It would usually take a few days before one of us found it. The game went on for months, and that poor peep turned as hard as a rock. 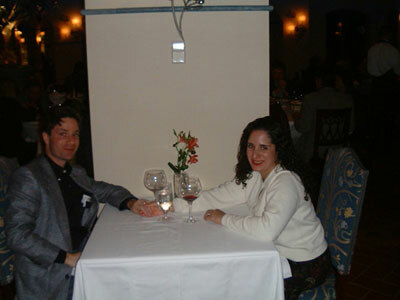 I don't know why we got such a kick out of it - my husband (who was my boyfriend at the time) thought we were crazy. An immature thing for a couple of 20-somethings to do, but we had fun with it!! Now she lives across the country from me, so this brought back lots of good memories. Nuria- I will take your weather from Spain. I would love to visit there. Cynthia- I don't know...maybe it is fixed. I could see it. Anj- Yes! Good idea. Just swap out the snowmen for regular peeps, or the bunny peeps. That is a funny story. That sounds like something my sister and I would do. I can only imagine how tough that Peep was. Thanks for sharing. Emiline -- these sound great but the pictures won't load on my computer! Oh well -- i'm sure they are delicious! Goodness, that Peep was perfect on its own! But your cupcake does look tasty. I think I remember a cupcake Throwdown with some bakery in LA, and she said the secret to her moist red velvet cupcakes is that she used vegetable oil. I buy my husband peeps every Easter; I didn't even know they made snowmen. Too cute. Seriously. Those are so adorable. Perfect. How can you eat those little guys?? The photos are great too! It's funny how sometimes the .jpg fairies cooperate! That is so funny that you did this recipe today. JUST today, I passed by some Texas-sized muffin pans and I almost bought them. Maybe tomorrow...if I ever see your pictures.. I love Coconut and how cute are the snowmen!! I can't see them either. WTF??? Katy- I don't know what's going on! I deleted the pictures and uploaded them again, so let's see if that works. Amy- I do like Peeps by themselves. I know what episode you're talking about. You have a good memory. Didn't Bobby win, though? Catherine- You see the pictures...good. Sue- You don't see the picture....bad. Jenny- You see the pictures....good. Tracy- You don't see the pictures...bad. No stocking candy, so I'm outta luck on this one. But jeez do I Love coconut! Very cute cupcakes...and you're right...great photos, too. I love it when mine don't have that unearthly yellow glow! Those are adorable. You are very creative. And the texture does look so moist. I want one! I love coconut. Those are so cute. The cupcakes remind me of Ina Garten's coconut cupcakes that my sister in law trots out every Easter (she bakes them in egg-shaped tins and colors the frosting). I think I like these better your style though. The coconut looks like snow with the peeps on top looking very appropriate. Anything with coconut is right up there in my books Emeline and then you added the cream cheese icing..over the top!!! Emiline, you are crazy! You take awesome pictures. Anyways, I had no idea that they made snowman peeps, they look tastier than the chicks. I wish I could reach into the screen and grab that cupcake. These look like good cupcakes but I am not a marshmallow fan ever since that time when I was 6 and I ate my marshmallows and my brother's and my grandmother's, it is not a pretty picture when you eat that many marshmallows. 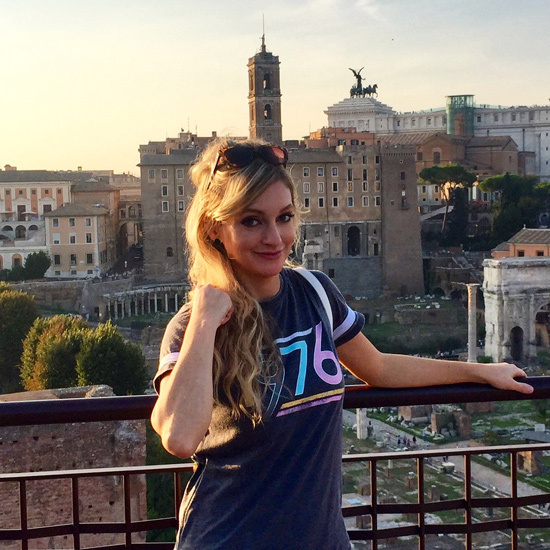 enjoy that 70F weather while you can. These are so cute! And I always like your photos! Love the cupcakes. Makes me wish it was Christmas again. Kelly- I'm familiar with that yellow glow. Annie- I love coconut, too. I always pick the chocolate with coconut in it, on Valentine's Day. TSC- Yes! I've tried heating them up. They make a good S'more. Dhanggit- I want to go to culinary school. I guess that's frowned upon. I want to live in southern France! Valli- Cream cheese is delicious with coconut. Sue- Now you see then, now you don't. Val- What you don't know is, you can grab them! Virtual cupcakes! Try them. Cres- Thanks for the congrats on my blog. I'm not sure why, though. Shayne- Your marshmallow story is hilarious. I can see why you don't like them. Mallow- Thanks, but yours are always perfect!